Growing up in Poland at the height of the solidarity movement, professor Agnes Zdaniuk witnessed injustice committed against those, including her father, who actively fought for better working and living conditions and the fall of communism. It is an experience that would see her family seek refuge in Canada, and help shape her life’s work researching revenge and forgiveness, topics that are becoming increasingly prevalent public conversations. Concerns of how individuals are marginalized by others, from the playground to the workplace, have been at the root of anti-bullying and fair treatment movements and policies of late. Zdaniuk, who examines these topics within an organizational context, concludes in her most recent research that idealized influence leadership can be a catalyst for positive change. In other words, leaders who promote collective harmony and demonstrate commitment to ethical principles in their own behaviour are most likely to foster an office environment where employees forgive others for mistreatment or wrongdoing, as opposed to antisocial responses such as avoidance and revenge. 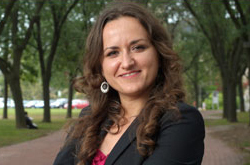 In the study “The role of idealized influence leadership in promoting workplace forgiveness” published in The Leadership Quarterly, Zdaniuk and co-author Ramona Bobocel from the University of Waterloo conducted an online experimental study of 50 undergraduate students and a web survey of 100 university alumni which demonstrated that idealized influence leadership encourages forgiveness following experiences of mistreatment. According to a 2014 survey by the Workplace Bullying Institution, instances of injustice are prevalent in office environments, with more than 25% of respondents indicating they are currently or have previously had direct experience with abusive conduct at work. With individuals in supervisory roles representing the majority of workplace bullies and competitive individuals most likely to choose revenge over forgiveness, Zdaniuk’s research suggests workplace environments might benefit from redefining success and retraining management staff. While the study explains the benefits of idealized influence leadership and promoting workplace forgiveness, more research is needed before these findings make their way into the office. Although conversations about bullying and mistreatment are becoming increasingly common and policies to diminish this behaviour are being enacted, Zdaniuk believes that injustice remains a normalized occurrence. When it comes to forming future leaders, Zdaniuk emphasizes that proper education is key. As an educator, she believes that leadership can be taught and promoting good values in future leaders is the way forward. She says that students should have the chance to demonstrate leadership through volunteering, fundraising and fighting for good causes. If they take these lessons and learn how to lead with the best interest of their staff in mind, they may be more likely to create an environment where employees favour prosocial reactions to mistreatment or wrongdoing, thus creating a more harmonious office culture.